Often Included Quartz is called scenic or garden quartz. The various types of Included Quartz are numerous. Perhaps enough for a web site of their own. We certainly don't have all of them. But we do have a nice little variety. Even a new one from Brazil, called Leolite. At least that's it's name for now. The cutter is naming it after him self. Our supplier says he is the only dealer in the US at this point in time. All in all these very interesting mixes give rise to a variety of lapidary, jewelry and specimen use. Inclusions of other minerals in clear or smoky quartz are not particularly uncommon and are often very attractive. Many minerals have crystals of other minerals, air, water, tar, petroleum, rocks and in the case of amber even animals included in their interiors. Included quartz is found world wide. But major sources for these types of gem materials are located in Brazil and Africa. Inclusions can be generalized in two categories. The first type are called early formed.This type begins when one crystal was growing and another mineral begins to make a small crystal on the surface of the earlier mineral. The first mineral continues to grow and may grow over and around the second mineral, thereby enclosing it. 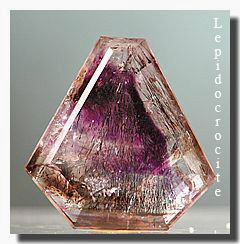 Examples ofthis type of inclusion, include tourmaline, rutile, actinolite, hedenbergite, hematite, and several others. The second type includes chlorite, cookeite, hematite, lepidocrocite,mica, pyrite, galena, adularia, and many others. This type of inclusion involves minerals that formed during initial crystallization and is a result of exsolution. This process is favorable at certain temperatures and pressures, while unstable at other temperatures and pressures. The minerals will then try and convert to a more stable chemistry. This often leads to undesirable minerals being forced out. A good example of this is rutilated quartz. The rutile is thought to have been in solid solution in the quartz and upon cooling, the rutile was forced out of the quartz structure. Resulting in microscopic highly oriented needles. 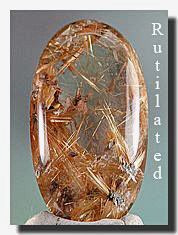 Rutile inclusions often are responsible for the effects of asterism and chatoyancy. 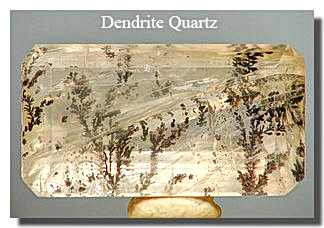 Another good example is Dendritic Quartz and Agate. The agate variety is also, often called Moss Agate. 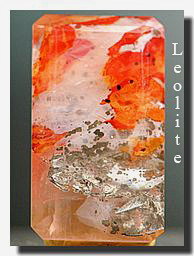 This type of included quartzis due to various type of oxides that are present in the quartz crystal. Which form interesting tree or moss like inclusions. Less well known varieties of included Quartz, are Tourmalited Quartz. 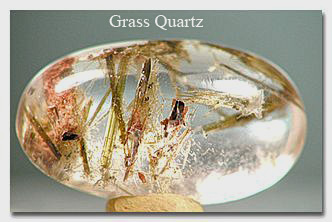 Which has black or dark green Tourmaline crystals, Actinolite or Grass Quartz. Which exhibits bright green actinolite crystals, that really look like grass and Dendritic Quartz. Which has brown to black iron dendrites, that appear to be plants or ferns growing inside the stone. Some very rare minerals are only known as small inclusions in other minerals. Sometims inclusions even turn out to be other gemstone minerals. Inclusions of air and water are called two phase inclusions and are commonly found in gypsum and quartz. Identification of inclusions may be difficult. Often only visual test are able to be performed on an including crystal, without removing it. Although some gemstones, contain inclusions that make them identifiable. Emeralds mined in Russia for instance, are known to have tiny inclusions of actinolite, unlike other emeralds. There are also optic tests that can be performed. Usually a reliable analysis can be obtained.